The growth of the global fitness and recreational sports center market is driven by factors such as surge in middle class population, shift in consumer preference toward better health, and increase in incidence of obesity. In addition, government support for health & fitness and availability of a variety of equipment & personalized fitness training programs at fitness and recreation sports centers have supplemented the market growth. However, high investment cost for opening fitness centers, high membership fees, and sedentary lifestyle are anticipated to hamper the market growth. The impact of the driving factors is expected to surpass that of the restraints. Conversely, growth in youth population across emerging countries and surge in business innovations and acquisitions & expansions in the industry are expected to offer lucrative opportunities for the global market. 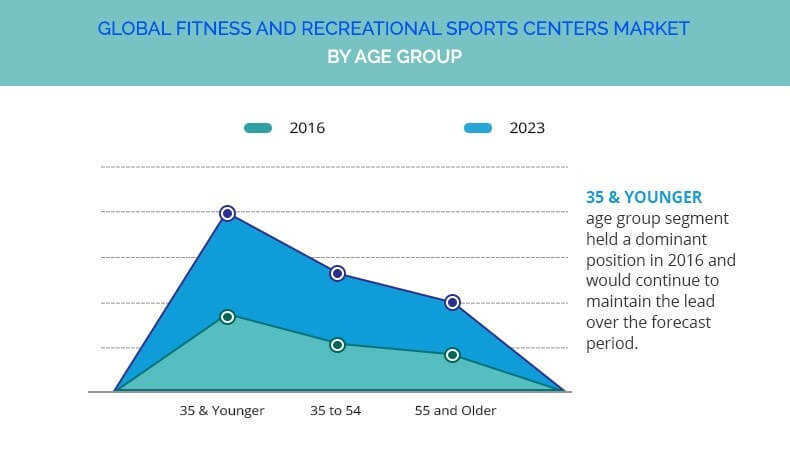 The report analyzes the global fitness and recreational sports center market on the basis of type, age group, and geography. The global market is segmented based on type as gymnasiums, yoga, aerobic dance, handball sports, racquet sports, skating, swimming, and others. By age group, it is classified into 35 & younger, 35-54, and 55 & older. The report includes the revenue generated from fitness and recreational sports centers across North America, Europe, Asia-Pacific, and LAMEA. The Global Fitness And Recreational Sports Centers Market is highly fragmented, and hence its growth is stagnated. However, the market is anticipated to witness high end-to-end overall growth in the near future, owing to increase in awareness for fitness among the young population. The fitness and recreational sports centers include gymnasiums, yoga, aerobic dance, handball sports, racquet sports, skating, swimming, and others. These centers have helped the population attain their fitness goals and also to manage their health concerns. In the past decade, the global fitness and recreational sports centers industry experienced a substantial growth. This is attributed to the fact that the aging population encouraged health and fitness clubs to widen their target demographic beyond the traditional market of 18-35 year old. 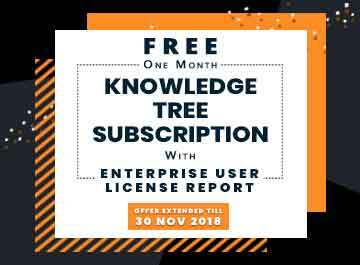 Industry operators are gradually expanding their target market to include 35 to 54-year-olds and individuals aged under 18. Approximately 40% of fitness and recreational sports center members are female, a proportion that has increased in recent years. The growth of female participation is likely a result of rise in number of female-only health club facilities. Depending on age group, the global market is fragmented into 35 & younger, 35-54, and 55 to older. The fitness and recreational sports center scenario varies across regions, and is majorly dependent on factors such as health awareness, lifestyle disease incidence, young population, and per capita income. Various types of fitness and recreational centers such as yoga, aerobic dance, and gymnasiums are preferred in different geographical regions due to the difference in consumer preferences. 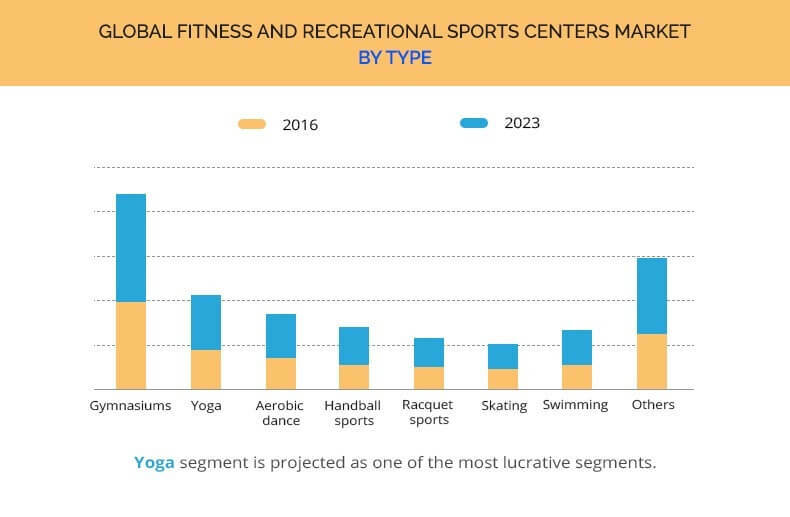 The key players in the global fitness and recreational sports centers market have strategically focused on expansion to gain significant share in the market. This report provides an extensive analysis of the current trends and emerging estimations in the global fitness and recreational sports centers market. In-depth analysis of the industry is conducted through market estimations of key segments for the period 2017 to 2023. Competitive intelligence of leading manufacturers and distributors of fitness and recreational sports centers helps understand the competitive scenario across geographies. 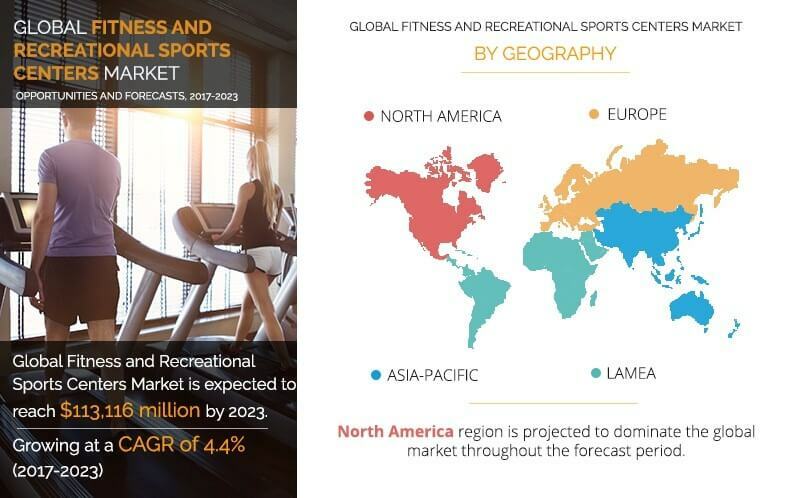 Comprehensive analysis of factors that drive and restrain the growth of the global fitness and recreational sports centers market is provided in the report. 7.1. 24 HOUR FITNESS USA, INC.
7.6. LIFE TIME FITNESS, INC.
7.9. TOWN SPORTS INTERNATIONAL HOLDINGS INC. Fitness and recreational sports centers are the facilities, which have equipment for exercise and physical fitness conditioning activities. The growth of the global fitness and recreational sports centers industry is driven by increase in youth population across the globe and shift in consumer preference towards better individual health. The international fitness chains and gyms have already started expanding their product and services to tap the developing markets to cater to the increasing customer requirements. Many key players have adopted the franchising model to enter in the developing markets and to expand their client base. The fitness customers are mostly in the age group of 35 & younger, who majorly focus on personal esthetics and fitness. North America and Europe are anticipated to hold the major share in the global market during the forecast period. India is projected to witness significant growth in the Asia-Pacific market. "Fitness and Recreational Sports Centers Market"